NOT charity, rather charitable, and the Stokes team stood in unison, rhythmically clapping Fortinet’s gesture and the player. Rambo advanced to 3rd (see beaming photo below, photo credit Avi Posesorsky) and then scored on his own on a single. A little kindness can go a long way. Buoyed by their unselfish action and resurgent with confidence, this after a difficult week while umping a game, Ram came to the plate next inning and launched one to deep center field, over the heads of Dahan and Brian Gutenplan, the entire Stokes’ bench yelling, “Stop at 1st!!!”. Third at bat, another key hit to the right side and in his final at bat, a chance to drive in the winning run, Ram lined out sharply to left-fielder Albert Mamane. His hitting line on the game ~ 3 for 4 with 2 runs scored and a ribby. Repeat: A little kindness can go a long way. 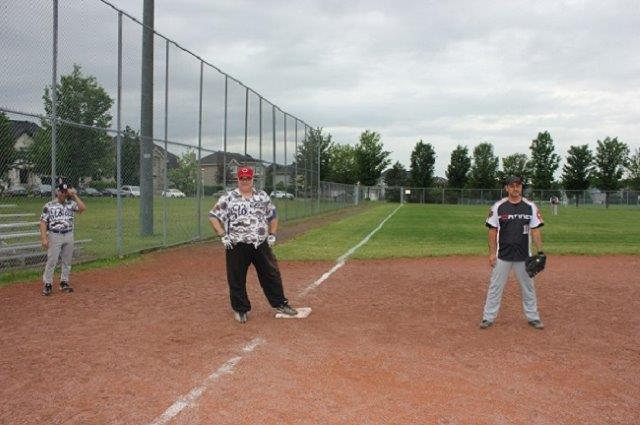 The game wasn’t without its moments with some tough calls but featured two teams that battled back and forth with Fortinet pecking away throughout and taking a late inning lead and, more importantly, the two teams kept their collective cool and no lines were crossed. Stokes eked out the win in their last at bat as the home team but if ever a game deserved to end in a tie, this one did. That act of kindness way back in the 3rd inning might have been the difference in the score of a game that ended with a one run result. And, as the day wore on, Stokes’ people starting feeling that perhaps, what Fortinet did should be paid forward. And, since both teams entered the game with the same record, what harm what it do to finish the day with the same record, all things being equal? A unanimous team vote and the game was recorded as a tie. Team Fortinet merited the Franc Jeu Point (ask someone with a kid in hockey). To be sure, there weren’t many choir boys on the field that day and now that the story is out in the open, there will surely be detractors who will argue about the result. Say what you will, I’m thinking that the result isn’t the story; the tie isn’t the story and those who miss the point, need to reread the story until they get it…Their spontaneous gesture, done in the moment, personified the values and sportsmanship our league stands for. It is with heavy heart that I once again find myself writing about one of our fallen members whose time came far too soon. Our season of baseball has been marred by one tragic loss heaped upon another. We have lost past members; members have lost siblings and parents. Now we have lost our very own Tom Theofanis. Tommy “T”, as he was known to all, joined the league in 1994 as a mid-season replacement for Bernie Donsky who had suffered a heart attack on the field. Tom was this year’s 6th round pick of Dagwoods (Schwartz & Schwartz). He started the season and before long felt weakness and some tightness in his chest which he chalked up to just having played ball. Tom quickly decided to have himself tested. His ekg was perfect but blood tests revealed that he’d suffered a minor heart attack and Tom was scheduled for what should have been routine (as routine as that might possibly be) valve replacement surgery. While waiting for this procedure, you would still see his dapper figure, tanned and fit looking, at the ballpark. I saw him there only days ago. I'm told he played golf this past weekend with some of our members. I entered the league part way through the 2003 season. That was back when you could get pulled off the street in flip flops to spare. My captains wouldn't let me pitch that season save for one inning in a lost cause and to only 3 batters, getting the hook after I got the 1st two outs but walked the 3rd man. As a new player entering a league of 180 men, you really don't know the players or where they play, or how good they are. I started the 2004 season wanting to pitch. There was one pitcher who stood out above the rest for me to learn from, one guy who owned the mound. He looked good out there, so very confident. He also owned the strike zone. While most other pitchers just laid it over the plate, Tommy T threw a sharp yakker, baseball slang for a curveball. His location was perfection and he walked no one. My first full season, I somehow got added by Harley Schwartz to the 2004 competitive tournament team as the 2nd pitcher, sharing pitching duties with Tommy T. I was so nervous because Tommy T was at his very best in the big games. He had masterful control and his pitches seemed to explode. It all came from his leg thrust. I watched and learned. Come the final and I was scheduled to replace Tommy for a couple of innings of the 7 inning game. As much as I wanted to pitch, we had taken a lead, the game was close and I just couldn't bring myself to have him catch for me with the great stuff he had that day. So I told him to keep going and I would catch him. What an experience! I set my glove up and in and he pounded a curve right there! I set up next pitch low and away and boom, right in the glove again, that exploding curve for another strike. What an honour to catch that man! A couple of years later, during the tournament, Tommy slid badly into 3rd and had to pull out. A pitcher’s biggest assets are his legs and Tommy’s leg took a long time to heal. Our team had enjoyed beating the “Kids” in the tournament for a couple of years. Then the “Kids” got smart and looked for a veteran pitcher who knew the hitters and could pitch this style of ball. They turned to Tommy and it was a new lease on life for the wily vet. 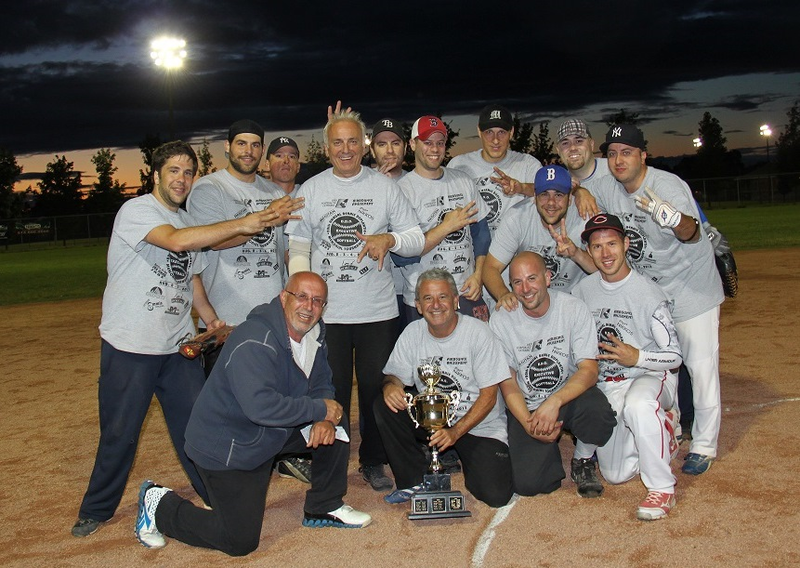 “Gramps” led his new teammates to a couple of tournament wins and he seemed to revel in the moment having recaptured glories past. We chided him mercilessly before and after each game with every bad joke or pun in the book for turning traitor ~ all good–natured. But during each game against Tommy, it was all business on both sides, we had to respect him. Tom was a gentleman on and off the field. He spoke quietly. In almost 11 years, I never saw him lose focus after a blown call or an error by a teammate. His ever present tight lipped smile on the mound belied his fierce competitiveness. He was hardest on himself. We both recently bemoaned how a couple of years ago, batted balls that we used to stuff into our back pockets were somehow going through us now. He refused to indulge creeping age as an excuse and, as he mentored me 10 years ago, neither shall I. Back in 2004, a trophy was handed out to the pitcher of the year for the very last time. It’s a large glass bowl on a base with name plaques of past winners. I recall, as the last holder of that dust collector, Tom Theofanis’s name adorning several places on the trophy. Last seen, it’s been malingering on a shelf in Leon Caron’s garage, until today. 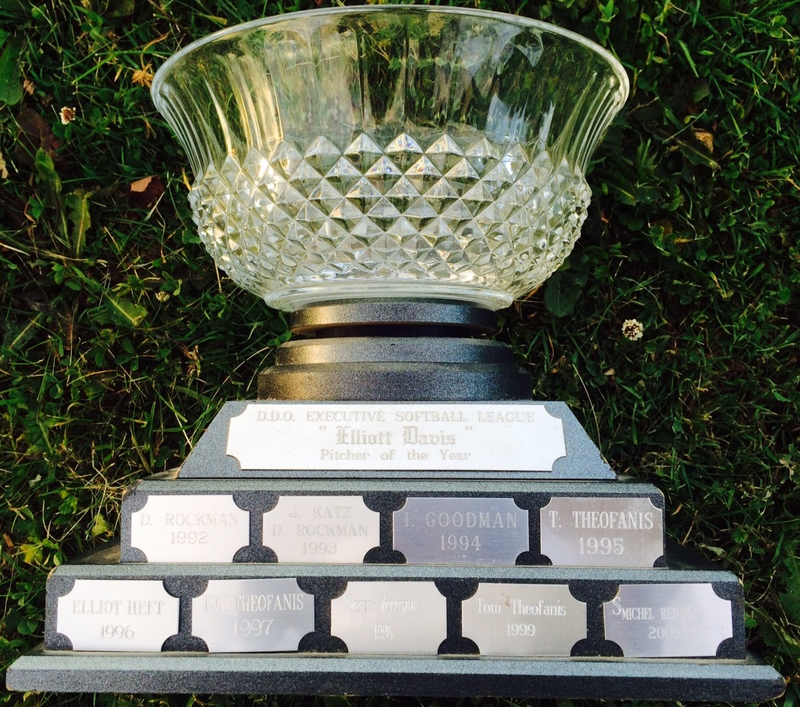 Wouldn’t it be nice if the trophy was rechristened the Tom Theofanis Memorial Trophy to be awarded to the pitcher of the year who best exemplifies Tom’s example of on-field achievement, dedication and class? We last wrote of the impressive exploits of my man Stewart Libstug who this season, batted his way to 19 consecutive hits. While I had asked some of our “Elder Statesmen” before writing my piece, none were able to recall a longer streak. Joe Paddington wrote in to whine that, among other things, he had dug through the statistical archives and had mathematically determined that Marc Shade was the actual holder of the consecutive hit record back in 1998 and that it was 21. What can’t be denied is that Messr. Shade, still a deadly hitter some 14 years later, did in fact hit an amazing .845 in 21 games played (David Turner and Marv Levine also hit .800 or better) that season. Paddington went on to produce some convoluted mathematics (Stephen Hawkins himself might have a hard time following the logic) attempting to prove his point. What is clear is that Shade only made 13 outs in 84 at bats or 1 out per every 6.5 at bats – WOW! I spoke to Marc about his prodigious season and he did say that his teammates at the time made more of a big deal about it than the rest of the league as he was a mere rookie. But yes, he does believe that anyone on team Mourelatos in 1998 would vouch for his streak of 21 consecutive hits. Shade went on to kibbitz with Libstug after (and ironically so) being the fielder of the ground out to 1st base on Libstug’s streak ender, that he wanted to get out of the way of the grounder but Libstug hit the ball too slowly to him. Accordingly, it seems appropriate to acknowledge Shade’s record of 21 during the “lively ball” era and Libstug’s record of 19 consecutive hits in the yellow, “dead-er ball” era. These impressive accomplishments stand as new targets of excellence for generations to come. Speaking of the “New Generation”, I had the privilege a few weeks back to partake in a tryout by invitation only of 13 of the new “hopefuls” for next year. I think Bobby Leftakis invited all his cousins and in-laws to try out! If I were a captain, I’d have been delighted to pick all 13 as the foundation for my team. It’s getting tougher to find enough outfielders to go around so it was nice to see a bunch of good ones. One not-so-young recruit, Hershey Gillman, parked the first pitch he saw over the fence in dead center – first batter, first pitch. It WAS the last one of the day too! Many of these boys are being pressed into extended tryout service as replacements for injured players. Hint - hint to you captains who NEVER come to the park other than to play. It might help your next draft to have a clue who some of these guys are…You can bet your bottom dollar that Larry Shapiro already has the book on them! The Tires of Canada may have come out the starting blocks a little flat but they are now the hottest team in the league after winning 6 of their last 7. They pounded out 32 hits in their latest “W”, a 21-3 dismantling of JAB. Team sponsor, Harold Busner, paced the attack going 5/5 with 4 ribbies and 4 runs scored, while Evan Boxer knocked in 5 big rbi’s. All this while still waiting for my little buddy Jeff Goodman to find his mojo (This oughta do it Jeff ;-)). In 1999, Vladimir Guerrero hit in 31 consecutive games for our beloved Montreal Expos. The Major League consecutive at bat hit streak is held by Walt Dropo at 12 in 1952, jointly with Pinky Higgins of the Redsox who also had a 12 consecutive hit streak in 1938. It’s time to include team Nikkos’ own Stewart Libstug in this elite company. Last night Stewart got two hits in his first two at bats to extend his own consecutive at bat hit streak to 19. Until he swung at an awful pitch and ended the streak in his 3rd and final at bat, his season’s BA over 11 games played stood at an AMAZING .846!!! None of the veterans I spoke with were able to recall as prodigious a streak in their time in the league. Way to go Stew!!! We’re approaching the half-way point of what’s shaping up to be a very competitive season. To date, while only 4 out of 12 teams are above .500, games are close and competitive and you can expect some movement in the standings in the 2nd half. Several games have come down to the wire. Stokes has won at least two in their final at bat. Best new name in the league, incoming spare ~ Giorgio Porcari ~ roll that over your tongue a few times -now that’s Delissio! 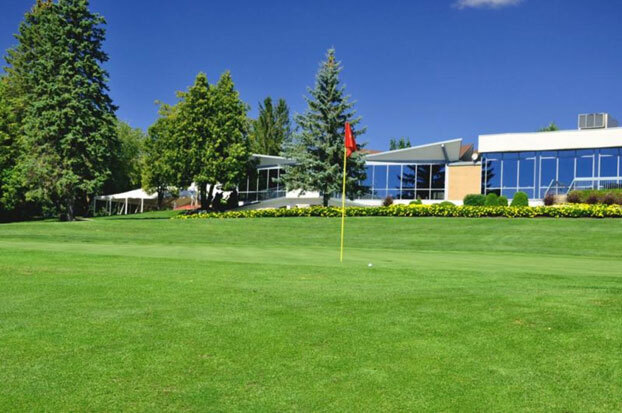 Many members and a few non-members took advantage of the Le Diamant Golf pass offer made to league members and alumni in appreciation of our support. For $650, you can purchase 12 rounds of golf, a per round cost of $54, taxes included!!! The passes can be used at ANY time with reservations allowed up to 4 days in advance. Passes can be shared or used with guests. You can also make use of all the facilities on the day you play (have your wife and kids meet you for a swim after your round) including the driving range, putting green, swimming pool and mini-putt. You also get a free post round beverage (beer on tap or soda) with each coupon. Tryouts are this Saturday April 21st, with the weatherman calling for 4* and a chance of snow?! It’s only a matter of time though before we’ll be wielding the bats for real…In the meantime, our banquet host, Le Diamant Golf Course and former league member Mike Sochaczevski has extended a fabulous offer to league members and alumni in appreciation of our support. For $650, you can purchase 12 rounds of golf, a per round cost of $54, taxes included!!! The passes can be used at ANY time with reservations allowed up to 4 days in advance. Passes can be shared or used with guests. You can also make use of all the facilities on the day you play including the driving range, putting green, swimming pool and mini-putt. The days are growing longer ~ usually we mourn less daylight as it inevitably means our season is drawing to a close. Today, despite our looking forward soon to sunny days at the park, we have first to mourn one of our own. Mike Lipson has lost his battle with cancer. Our league has lost another good man to this insidious disease, though not usually so young. I’m not going to pretend that I knew him well. That will be left to his lifelong friends to speak of. I was fortunate to play alongside him on several Tournament teams, winning ones. I was as fortunate to have played against him, to have had him take me out of the park more than once in 2008, a season that saw him lead Dagwoods to a league championship with 14 homers, 71 RBI’s and a .667 BA in 23 games. That was shortly after his having led us to our tournament win in August. 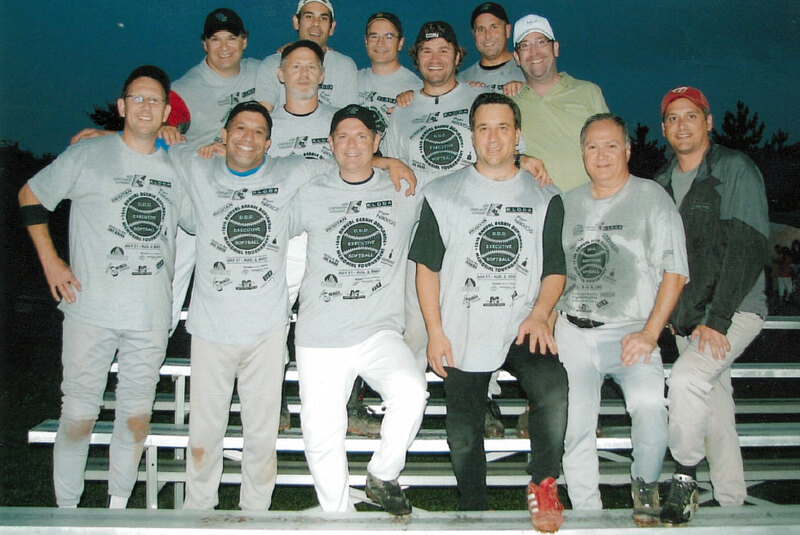 Team Dagwoods - 2008 Season Champs (Mike Lipson - Front Row with Yankees Cap). Click Photo to Enlarge. And why does any of that matter now? Maybe it doesn’t but it's how he won that made him respected by all who had the privilege to play with and against him. After posting solid numbers for a couple of seasons and monster ones in ’08, he surely had the right to adopt the traits of some of our elite egos. But does anyone ever remember Mike Lipson without a smile on his face? We can all still hear that gregarious, hearty, honest laugh that seemed to emanate from the soles of his cleats. He was positive in every way. He valued and respected those he played with and against. Most importantly, he remembered. He remembered the times he shared with you even though you both knew you might never share the same bench again. 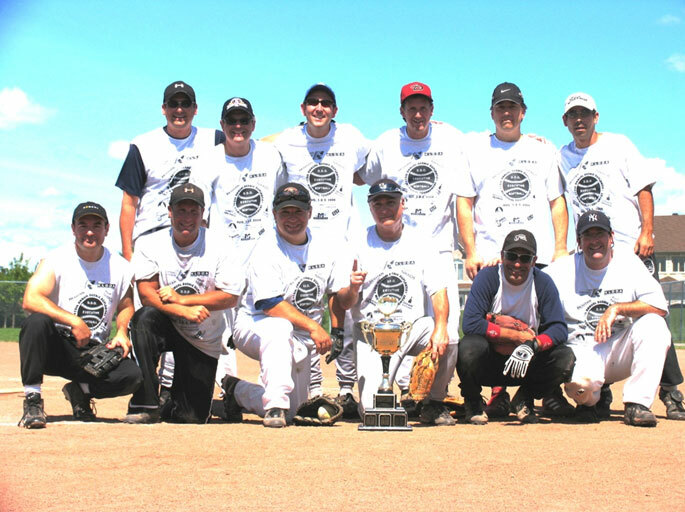 2008 Duplantie Tournament Champs (Left Photo: Mike Lipson - Middle Row Far Right, Right Photo: Mike Lipson - Front Row Far Right). Click Photos to Enlarge. Over the past couple of years I saw Mike a few times fighting the good fight. The last time at our park was summer of 2010, at least that’s when I think it was. He was in street clothes while our team had a practice or maybe it was a practice before a game. He asked me to pitch to him but to go easy on him. Ha! Go easy?!?! This beast who destroyed me in ’08 was asking ME to go easy on him! He should only have known that my season could have ended right then and there as I prayed to G-d to groove him one that he could drive as far as possible. I would have stayed out there all day and night for that. We didn’t stop though until he made solid contact. Even Lippy couldn’t beat the “yellow ball”. I never heard Mike utter an unkind word against an umpire or opponent. But what I’ll remember most about “Lipper”, though we only played together in tournaments, is how each and every time he saw me at the park, he greeted and welcomed me like a teammate. With Mike, once a teammate, you knew that you were his teammate for life. May we all dedicate this coming season to his memory…May G-d bless and keep his family.